"The adventures of Cutler Phiney, an extraordinary man-about-history." Fabulous tales recounted by adventurer Cutler Phiney. He is a most extraordinary figure of importance in prominent historical events yet one who has eluded historians to remain out of the history books. He shares his exploits with only a select few, among whose numbers you may luckily count yourself, should you accept his gracious offer of a story or two. Cutler Phiney Stories has not been tagged yet. 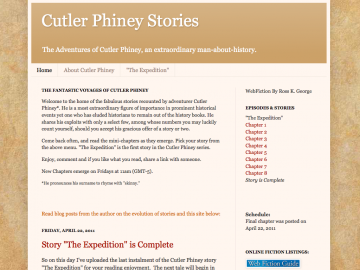 Help others find Cutler Phiney Stories by tagging it! Cutler Phiney Stories has not been reviewed yet. Cutler Phiney Stories has not been recommended yet.